Adds a callback function that will be called whenever one of the Artist‘s properties changes. Returns an id that is useful for removing the callback with remove_callback() later. Test whether the artist contains the mouse event. Returns the truth value and a dictionary of artist specific details of selection, such as which points are contained in the pick radius. See individual artists for details. Recursively find all Artist instances contained in self. None: return all objects contained in artist. class instance: e.g., Line2D. Only return artists of class type. If include_self is True (default), include self in the list to be checked for a match. Return a list of the child Artist`s this :class:`Artist contains. Return the _contains test used by the artist, or None for default. Return the Figure instance the artist belongs to. Get the label used for this artist in the legend. Only supported by the Agg and MacOSX backends. Return the Transform instance used by this artist. Return the clip path with the non-affine part of its transformation applied, and the remaining affine part of its transformation. Get the axes bounding box in display space. Subclasses should override for inclusion in the bounding box “tight” calculation. Default is to return an empty bounding box at 0, 0. List the children of the artist which contain the mouse event event. Returns True if the artist is assigned to a Figure. Returns True if Artist has a transform explicitly set. Fire an event when property changed, calling all of the registered callbacks. Return True if Artist is pickable. Remove the artist from the figure if possible. The effect will not be visible until the figure is redrawn, e.g., with matplotlib.axes.Axes.draw_idle(). Call matplotlib.axes.Axes.relim() to update the axes limits if desired. Note: relim() will not see collections even if the collection was added to axes with autolim = True. Note: there is no support for removing the artist’s legend entry. Remove a callback based on its id. Set the artist’s animation state. Set the Axes instance in which the artist resides, if any. Set the artist’s clip Bbox. Set whether artist uses clipping. When False artists will be visible out side of the axes which can lead to unexpected results. If the mouse event is over the artist, return hit = True and props is a dictionary of properties you want returned with the contains test. Set the Figure instance the artist belongs to. Set the label to s for auto legend. ACCEPTS: string or anything printable with ‘%s’ conversion. set path_effects, which should be a list of instances of matplotlib.patheffect._Base class or its derivatives. Force rasterized (bitmap) drawing in vector backend output. Set the Transform instance used by this artist. Set the zorder for the artist. Artists with lower zorder values are drawn first. Update the properties of this Artist from the dictionary prop. Copy properties from other to self. A helper class to inspect an Artist and return information about it’s settable properties and their current values. Initialize the artist inspector with an Artist or sequence of Artists. If a sequence is used, we assume it is a homogeneous sequence (all Artists are of the same type) and it is your responsibility to make sure this is so. return ‘PROPNAME or alias’ if s has an alias, else return PROPNAME. Recursively find all matplotlib.artist.Artist instances contained in self. 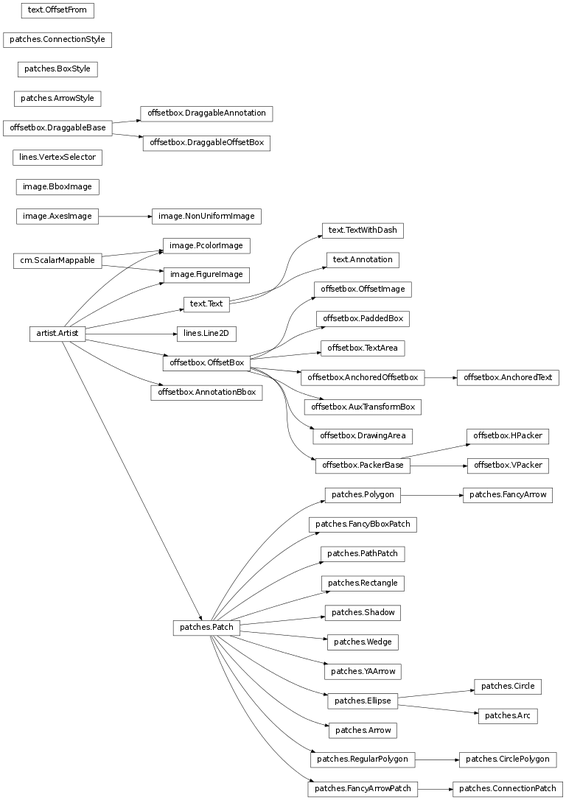 Get a dict mapping fullname -> alias for each alias in the ArtistInspector. Get the attribute strings with setters for object. e.g., for a line, return ['markerfacecolor', 'linewidth', ....]. Get the legal arguments for the setter associated with attr. Return True if method object o is an alias for another function. Return the getters and actual values as list of strings. If prop is None, return a list of strings of all settable properies and their valid values. If prop is not None, it is a valid property name and that property will be returned as a string of property : valid values. Decorator for Artist.draw method. Provides routines that run before and after the draw call. The before and after functions are useful for changing artist-dependant renderer attributes or making other setup function calls, such as starting and flushing a mixed-mode renderer.